Good marketing starts on the foundation of good strategy. From Strategy flows Programs that consist of a careful selection of Marketing Elements. Many customers have well developed, clear, concise and updated strategies. Others do not, and still others in rapidly evolving markets find themselves in need of a marketing strategy refresh. Following establishment of a solid strategy, companies should next focus on their social currency strategy and development along with a spectacular website that becomes an element of the brand experience, offers customer service functions and builds brand value over time. Ready to Start Your Website Design? Before any firm approaches a website design company or starts an email marketing program they should have a firm strategy. Most executives are quite familiar with the basic concepts of marketing strategy and are familiar with many of the tools used to develop strategy. What is often missing from the tool kit of executives in small to mid-size firms is a strong strategy process – the step-by-step methods used to create well-founded marketing strategy. We offer the marketing strategy process. Our marketing strategy process is a step-by-step system that is rigorous, quantified and adaptable to the specific conditions in various markets. Our system consists of a 4 phase process. 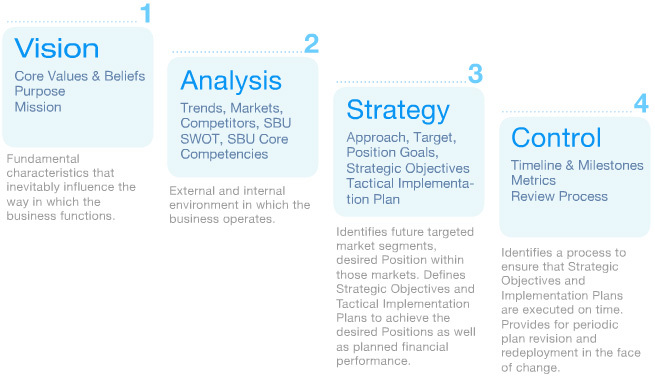 The marketing strategy process starts on the basis of a corporate or business unit Vision. From this point 18 individual workflows are executed to complete the marketing strategy process. The result is a set of clear Strategic Objectives (SO’s) supported by detailed Tactical Implementation Plans (TIP’s) complete with deliverables defined, responsibilities assigned, timelines, and a control process to review, metric and keep the strategy implementation on track. After the basic stratgic foundation is in place, a company can then focus on social currency strategy. We offer guidance ranging from full marketing strategy development which may take a team of executives 12-15 days of full offsite work to smaller modules that can often be completed in a day or two.